Have you tried diets and cleanses that promise you great results but leave you feeling depleted? Or worse, do you notice weight gain after going on a weight-loss diet that sets you up for failure? This is because most diets and cleanses don't serve the body (or mind) long-term. Food should make you feel full, energized, and satisfied. Insistently counting calories, going on extreme water fasts, and weighing yourself constantly has been the norm in diet and weight-loss culture. But it doesn't have to be! Ditch your scale, calorie counting, and overly-restrictive eating. Instead, let's focus on real foods that support your individual needs. Find out how holistic nutrition support from Paige can help you achieve your health goals! I offer one-on-one nutritional counseling, group-facilitated classes, workshops, corporate wellness programs, and more. I work with a variety of health issues including digestive concerns, hormonal imbalance, weight management, detoxification, food allergies, autoimmune conditions and natural approaches to anxiety and depression. Holistic nutrition is a non-dogmatic, scientifically researched focus of study in the health field. Instead of relying on out-dated USDA recommendations for what your "plate" should look like, it looks at the individual and his or her environment, lifestyle, and genetics, not just the dis-ease. This whole person approach to nutrition incorporates real food, herbs, and high-quality supplements and probiotics. Since the mind, body, and spirit are all connected to one's wellness, I believe nutrition shouldn't stop at what's on your plate. Twenty one days without sugar? Is that possible? Yes it is! Tens of thousands of people have already used this program to reset their body and habits. 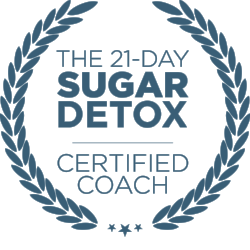 As a Certified Health Coach for the 21-Day Sugar Detox, I will be there to assist you in every step of the way. This includes practical daily meal plans with delicious recipes, how to grocery shop and clean out your kitchen pantry, what to do if you're traveling for work, going out with friends, or feeling the "carb flu." Discover how energized, focused, and empowered you can feel by curbing your sugar and refined carb cravings!